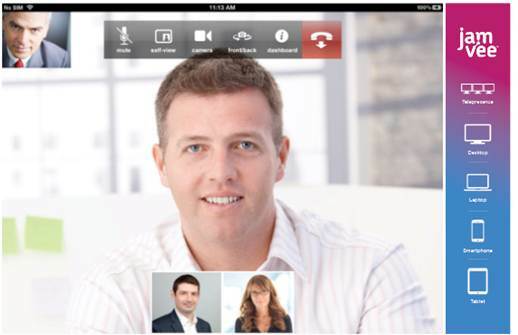 LONDON & MUMBAI, India--(BUSINESS WIRE)--Ushering in an era of truly global video communications,�Tata Communications�today launches jamvee�, a multi-device compatible cloud-based video conferencing service that allows anyone to take part in a video meeting from any location via a desktop computer, laptop, tablet, smartphone or a dedicated Telepresence room. "By supporting a wide range of video formats with usage-based plans, compelling prices, easy-to-use reservationless setup and ready-to-run software clients, jamvee� matches the requirements of today's mobile global workforce." Delivered through�the world's only fibre optic cable ring around the globe, jamvee� is a truly a global video conferencing tool for enterprises that makes video conferencing - both within and between companies - as easy as making a traditional audio conferencing call. Now making a multi-person business call from home, your office or even on route to the airport has never been so easy. With today's mobile workforce, video conferencing is becoming increasingly popular amongst organisations as a way to increase productivity. However, it hasn't yet realised its true potential due to quality and interoperability issues, especially with multi-user global video conferencing. This can often be seen with the over-the-top (OTT) video communication solutions that use only the Internet to connect users. Jamvee� is different because every jamvee� video meeting is carried across the world's largest and furthest-reaching undersea cable network. This robust connectivity backbone from Tata Communications ensures consistent global access and reliability needed by enterprises and professionals for crisp, secure and hassle-free video collaboration - whether at the office, at home, or on the move. John Hayduk, Tata Communications, President and CTO,�says, "Lack of interoperability, consistency of experience per location, complicated price plans and the need for third-party reservations have stood in the way of truly global enterprise collaboration. Jamvee� overcomes these barriers by making video conferences easy and on-demand, while seamlessly bringing together all video platforms, room systems and endpoints in a simple, as-you-need it and elastic pre-packaged service. It's so easy to use, instant and affordable. It's what enterprises have been asking for. " The jamvee� software application supports Windows, Mac OSX, and iOS devices - with Android support following in August 2013. Users of Microsoft Lync and other video conferencing software, as well as those with access to standard video conferencing systems such as Immersive Telepresence, can also meet using jamvee�. Up to 46 participants can join each conference at the touch of a button, bringing globally dispersed teams in fast-moving businesses closer together than ever before as the bring-your-own-device (BYOD) culture continues to gather pace. So how does it work? Just like an audio conference you can access host and participant PINs on the jamvee� portal, and send the participant PIN to people you want to meet with. Participants can then use any existing video system or Telepresence room that they have access to, or they simply download the free jamvee� app from the Apple app store or the�jamvee� portal. Everyone taking part in the meeting just dials the same number (or in the case of the jamvee� app, presses the 'Join Conference' button) and enters their PIN to join the meeting - ensuring secure and private meetings both within your business and across multiple organisations / parties. 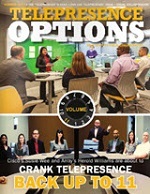 "Jamvee� represents an example of much-needed industry progress in merging immersive Telepresence services with the larger world of global video-conferencing," says�Brian Washburn, Research Director, Network Services, Current Analysis.�"By supporting a wide range of video formats with usage-based plans, compelling prices, easy-to-use reservationless setup and ready-to-run software clients, jamvee� matches the requirements of today's mobile global workforce." Jamvee� also provides a self-service portal for the professional user needing a personal video service. Simply use your credit card to purchase minutes and off you go (billed on a per-minute basis). Designed to easily integrate with Telepresence suites and other standards-based video systems, jamvee� brings extended ROI to existing enterprise video assets. And, unlike current products on the market, billing is per endpoint and not per screen (e.g. a three screen Telepresence room will only count as one endpoint). "Jamvee� is an excellent tool to conduct productive and collaborative video meetings with clients who are based at multiple locations across continents. The ease of using video services on the move and on any device or platform, makes Jamvee highly preferred by global users" says�Mandar Marulkar, Head of IT, KPIT Cummins. Tata Communications' mission is to create the world's richest open video ecosystem. The company's portfolio includes business services, cloud-based video services and the world's widest-reaching Telepresence network, to name but a few. Tata Communications' offering culminates under the�Global Meeting Alliance� (GMA),�an open business video ecosystem initiative, which provides participating enterprises and service providers with greater global reach, lower total cost of ownership and a world-class user experience. Jamvee� will be available through the GMA to all its alliance and service provider members, enabling enterprises to further expand their business community, through even greater interoperability. Tata Communications Limited along with its subsidiaries (Tata Communications) is a leading global provider of a new world of communications. With a leadership position in emerging markets, Tata Communications leverages its advanced solutions capabilities and domain expertise across its global and pan-India network to deliver managed solutions to multi-national enterprises, service providers and Indian consumers. Tata Communications' depth and breadth of reach in emerging markets includes leadership in Indian enterprise data services, leadership in global international voice, and strategic investments in South Africa (Neotel), Sri Lanka (Tata Communications Lanka Limited) and Nepal (United Telecom Limited). Tata Communications Limited is listed on the Bombay Stock Exchange and the National Stock Exchange of India. Certain words and statements in this release concerning Tata Communications and its prospects, and other statements, including those relating to Tata Communications' expected financial position, business strategy, the future development of Tata Communications' operations, and the general economy in India, are forward-looking statements. Such statements involve known and unknown risks, uncertainties and other factors, including financial, regulatory and environmental, as well as those relating to industry growth and trend projections, which may cause actual results, performance or achievements of Tata Communications, or industry results, to differ materially from those expressed or implied by such forward-looking statements. The important factors that could cause actual results, performance or achievements to differ materially from such forward-looking statements include, among others, failure to increase the volume of traffic on Tata Communications' network; failure to develop new products and services that meet customer demands and generate acceptable margins; failure to successfully complete commercial testing of new technology and information systems to support new products and services, including voice transmission services; failure to stabilize or reduce the rate of price compression on certain of the company's communications services; failure to integrate strategic acquisitions and changes in government policies or regulations of India and, in particular, changes relating to the administration of Tata Communications' industry; and, in general, the economic, business and credit conditions in India. Additional factors that could cause actual results, performance or achievements to differ materially from such forward-looking statements, many of which are not in Tata Communications' control, include, but are not limited to, those risk factors discussed in Tata Communications' various filings with the United States Securities and Exchange Commission. These filings are available atwww.sec.gov. Tata Communications is under no obligation to, and expressly disclaims any obligation to, update or alter its forward-looking statements. \"By supporting a wide range of video formats with usage-based plans, compelling prices, easy-to-use reservationless setup and ready-to-run software clients, jamvee� matches the requirements of today's mobile global workforce.\"
John Hayduk, Tata Communications, President and CTO,�says, \"Lack of interoperability, consistency of experience per location, complicated price plans and the need for third-party reservations have stood in the way of truly global enterprise collaboration. Jamvee� overcomes these barriers by making video conferences easy and on-demand, while seamlessly bringing together all video platforms, room systems and endpoints in a simple, as-you-need it and elastic pre-packaged service. It's so easy to use, instant and affordable. It's what enterprises have been asking for. 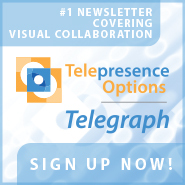 \"
\"Jamvee� represents an example of much-needed industry progress in merging immersive Telepresence services with the larger world of global video-conferencing,\" says�Brian Washburn, Research Director, Network Services, Current Analysis.�\"By supporting a wide range of video formats with usage-based plans, compelling prices, easy-to-use reservationless setup and ready-to-run software clients, jamvee� matches the requirements of today's mobile global workforce.\"
\"Jamvee� is an excellent tool to conduct productive and collaborative video meetings with clients who are based at multiple locations across continents. The ease of using video services on the move and on any device or platform, makes Jamvee highly preferred by global users\" says�Mandar Marulkar, Head of IT, KPIT Cummins.